I am an instructor at Brigham and Women’s Hospital and Harvard Medical School in Boston. I received my PhD in biochemistry and molecular biology from the University of British Columbia, Canada, where I worked closely with Canadian Blood Services to improve blood platelet processing and storage. I continued my research as a postdoctoral fellow at Brigham and Women’s Hospital and Harvard Medical School in Boston, where I studied platelet production in Joseph Italiano’s group. There I won a K99/R00 grant which prompted my promotion to instructor at Harvard (I would have been forced out of academia due to lack of funding otherwise), and now my research focuses on developing bio-mimetic microfluidic platforms to generate functional platelets and new targeted therapies for thrombocytopenia. During this time I co-founded Factual Footage Inc., a science consultancy for the film and television industries, with the aim of ensuring scientific authenticity in the arts; Criterion Bioscience, an online resource for biotech investors, where I manage a scientific advisory board and oversee operations of the firm’s scientific review process; and most recently Platelet BioGenesis, a biotech company with the goal of producing the world’s first donor-independent human platelets for human infusion, which I started with my postdoctoral mentor (Figure 4). Figure 4: Click on Image to Enlarge. 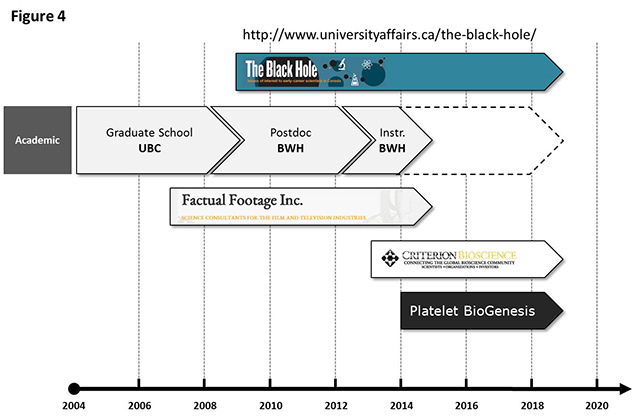 Throughout this time I have been an active political blogger, writing for University Affairs, a Canadian journal on higher education, under the blog series The Black Hole, which focuses on issues affecting early career scientists in Canada. I maintain this blog with Dr. David Kent, a Canadian on the other side of the pond, at the University of Cambridge. We post weekly, and I strongly invite you to visit this site often if you are interested in honest discussions on academic career advancement, higher education, and science policy issues. While Dave and I have very different approaches to career development, both of us are biomedical research scientists, and our articles comprise Canadian, American and European perspectives. So getting back to the question at hand – I am you. We share an education, training, and early career trajectory, and most likely interests as well. I am also a serial entrepreneur, and my experience in this space, as well as my exposure to science policy as it affects early career scientists are worth recounting. Lastly, I am a firm believer in social enterprise and ascribe passionately to the idea that if our goal is to improve human health and knowledge through discovery, we do so better together, by elevating one another, than by holding each other back. I’ve broken up my thesis into three major themes and I’ll try to stick to them. I want this to be an interactive discussion. I encourage you to post your questions and comments along the way, and that you continue this discussion throughout your long and prosperous careers. We are all better by elevating one another.